When it comes to the HUF team, it’s style first and foremost. If you ever doubt why a certain skater is on the squad, you need to get checked; each and every skater that’s been drafted to the skate roster has a unique style of their own and must be approved by Huf himself, which speaks volumes and is a testament to the overall “look and feel” of the company. This holds true with HUF’s legendary silent assassin Brad Cromer, who’s been with the company for a long time, and is a seasoned veteran of the skate industry, holding it down since the days of Rasa Libre. If you don’t remember Rasa Libre from the ancient days of magazine ads, you’re probably a millennial who only knows Brad through the few Krooked edits that pop up on your youtube subscription feed, I digress. But if there’s one thing you need to absorb from the text I’m writing before your limited attention span gives up. Is that I’m proud you’ve read this far to show appreciation for the humble professional skateboarders that let trick selection and style dictate themselves in a time where skating in designer clothes, competing in the Olympic’s, energy drink sponsorships, and everything irrelevant to street skateboarding’s core is slowly diluting the culture. At the end of the day, companies like Huf and Krooked can stand the test of time since they’re backed by the originators of culture, and have the foresight the average Joe can’t see when it comes to selecting brand ambassadors, and producing exceptional products. The Cromer 2, released in February, is a testimony to the aforementioned; it’s a pure skate shoe that doesn’t need the frills and thrills to sell itself. Read on to see how they did in our lengthy weartest. The HUF Cromer 2 fits rather small, so we would advise you to try it on in the skateshop of your choice. The HUF Cromer 2 is exceptionally durable for a vulcanized shoe. Its whole toebox and general front foot area is absent of any major seams and outfitted with extremely durable thick suede leather. This is perfectly designed for durability since most skateboard-related signs of use can first be seen in those areas. The seam that connects the toe area’s upper with the lace section is positioned strategically to prevent any contact with the abrasive griptape. Since there are no critical seams around that area, ollie holes or other openings were fully prevented. Although the outsole showed signs of wear, it was only the first layer that wore down. 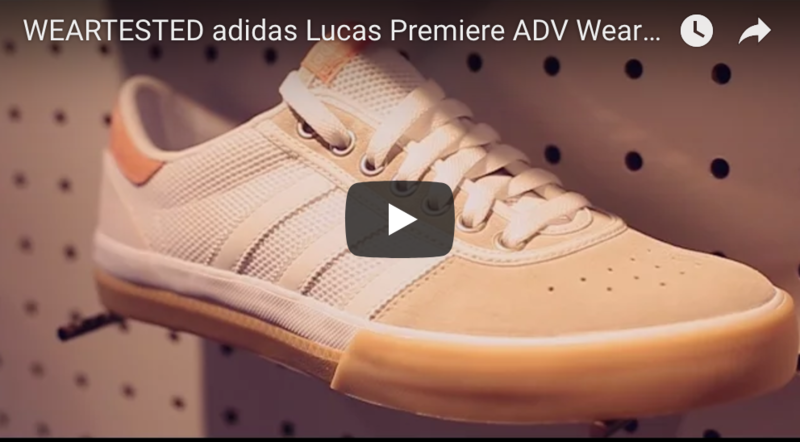 Under the suede lies an additional protective rubber layering which increases the lifespan of the shoe’s durability even if the suede upper has an ollie or a kick flip hole. The eyelets for the laces are also positioned higher up and closer to each other, minimizing the surface area of contact, which helped protect the laces extremely well. The cushioning abilities of Brad Cromer’s second pro model however, are average. The sole itself is very thin, which decreases its cushioning abilities. The shoe’s profile picture shows an insole that is higher in the heel and lower in the toe area. 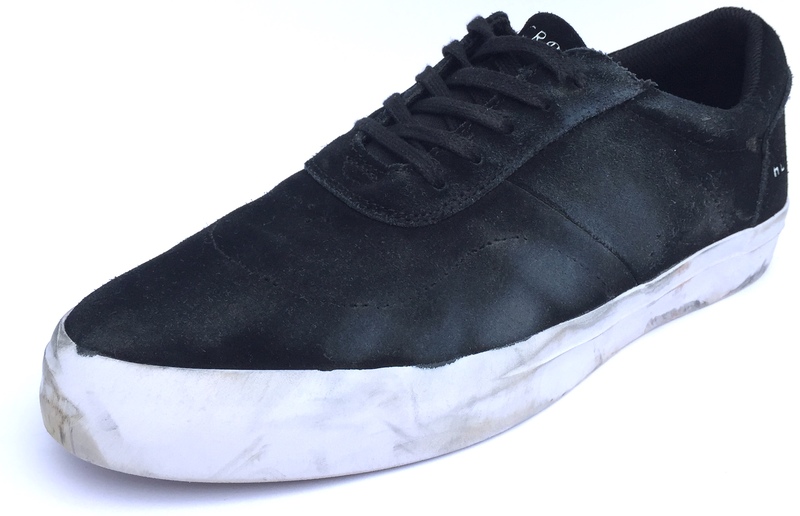 This slightly thicker molded PU insole improves cushioning, but even so, those habitual 10 stair skaters will still be left without much protection. Shape is an important design element for the HUF Cromer 2, as it is very slim and tight. Initially, the shoe feels flexible right out of the box, and after 2-3 sessions, the construction breaks in softer and adapts really well to the foot. The most impressive characteristic of the shoe was that it kept it’s shape the whole time. The toe area is rather slim, but the model gets wider towards the mid-foot-area. The toebox itself is slim and pointy; overall, people with slimmer feet will especially enjoy this model. Since the shoe features basic cushioning qualities, the boardfeel is excellent. The sole throughout the whole toebox and frontal area is really thin, which leads to great contact with the board. Grip did not decrease throughout our 10-hr test and performed very well. HUF uses their special Infinity Rubber vulcanized outsole which comes close to a vulcanized shoe from Vans. In addition, the sole does feature a wider HUF sole pattern, which makes for an evenly distributed spread of grip; since the compound is extremely grippy, it could also lead to too much grip. The wide grooved patterns in the sole and the thin sole increase flexibility which helps the shoe adapt extremely well to the shape and concave of the board. The Cromer 2 satisfies all your needs when it comes to stability. Since the shoe is slim and low cut, it fits to your foot very well. The shoe doesn’t have too many elements of support, but because it is slim fit, it hugs the foot closely and leaves a very secure feeling. With that said, this slim silhouette also has its negative points; it’s pretty easy to get blisters on your toes, depending on the shape of your foot. Although the shoe becomes softer, it does maintain its structural strength throughout the whole time skating since it was designed with a stable construction in mind. The heel is hard, which does adds to the support but is also very thin. With regards to comfort, the Cromer 2 performs average. We define comfort with breathability, weight and step-in feeling. When it comes to breathability, the shoe is average since there are only tiny design features involved, however the shoe’s weight and step-in are quite satisfactory to balance overall comfort with an average evaluation. The HUF Cromer 2 features a simplistic design, it excels when it comes down to durability, which is surpasses the industry’s standards for low cut vulcanized shoes. Boardfeel, grip and stability are also the strength’s of the shoe. However, the below average cushioning and comfort, were points of weakness that could be better improved.